Capable of stretching cells in culture: functions by applying a stress load to cells growing in the CO2 incubator. Simultaneously stretches cells in multiple chambers to enable comparison between samples. The system’s mechanical stretching unit operates inside the CO2 incubator, while the control unit is established outside. Detachable stretch chamber mounting unit can be transferred to a clean bench, enabling aseptic operations. Two versions of the main stretch unit are available, depending on the size of the stretch chamber to be employed: 4 cm2, 10 cm2. The smaller 4 cm2 version supports up to 8 chambers in parallel, whereas the 10 cm2 version supports up to 6. 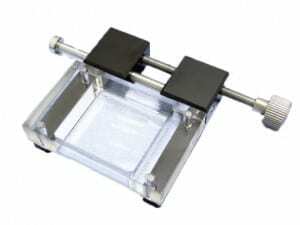 The larger 10 cm2 chambers are best suited to biochemical research such as gene and protein expression. water that cools the main motor driving the stretch unit. cable bundled with the tubing used for water cooling the main unit motor. STB-1400-10: Uses 10 cm² chambers, supports up to 6 units. Detachable stretch chamber mounting unit can be covered with a lid and placed in a culture plate. HIGH SPEED MODELS ALSO AVAILABLE. 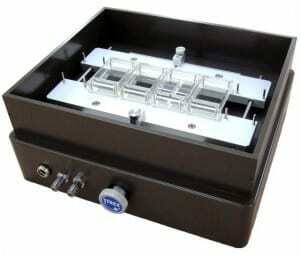 The STB-100 system applies cell stretching and compression force, but is operated manually. It is used for evaluation purposes in considering the introduction of fully automated stretching systems, such as the STB-1400. 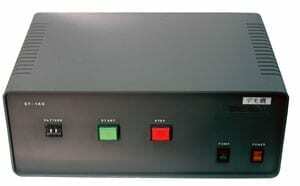 The manual system employs the same chambers as the STB-1400 system. Two versions are available, depending on the size of the stretch chamber to be used in the user evaluation. Conducting observations using the STB-100 under a microscope: To capture images under the microscope, fix the chamber in with the device in flipped position, opposite the normal orientation. STB-100-10 (for 10 cm2 and multi-well chambers) Stretch ratio: Up to 20% max. Each turn of the dial increases the ratio by 0.5 mm (equating to a 2.5% increase for the STB-100-04 system and 1.6% for the STB-100-10). Note: Cells should be cultured by placing the stretch system into a culture plate.